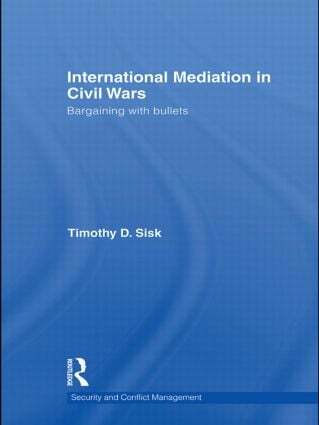 This book evaluates the role of international mediators in bringing civil wars to an end and makes the case for ‘powerful peacemaking’ – using incentives and sanctions – to leverage parties into peace. As internal violence within countries is a hugely significant threat to international peace in the post-Cold War era, the question of how these wars end has become an urgent research and policy question. This volume explores a critical aspect of peacemaking that has yet to be sufficiently evaluated: the turbulent period beyond the onset of formal or open negotiations to end civil wars and the clinching of an initially sustainable negotiated settlement. The book argues that the transnational flow of weapons, resources, and ideas means that when civil wars today end, they are more likely to do so at the negotiating table than on the battlefield. It uses bargaining theory to develop an analytical framework to evaluate peace processes – moving from stalemate in wars to negotiated settlement – and it rigorously analyses the experiences of five cases of negotiated transitions from war and the role of international mediators: South Africa, Liberia, Burundi, Kashmir, and Sri Lanka.